John II (French: Jean II; 26 April 1319 – 8 April 1364), called John the Good (French: Jean le Bon), was King of France from 1350 until his death. He was the second monarch from the House of Valois. When John II came to power, France was facing several disasters: the Black Death, which killed nearly half of its population; popular revolts known as Jacqueries; free companies (Grandes Compagnies) of routiers who plundered the country; and English aggression that resulted in disastrous military losses, including the Battle of Poitiers of 1356, in which John was captured. While John was a prisoner in London, his son Charles became regent and faced several rebellions, which he overcame. To liberate his father, he concluded the Treaty of Brétigny (1360), by which France lost many territories and paid an enormous ransom. In an exchange of hostages, which included his second son Louis, Duke of Anjou, John was released from captivity to raise funds for his ransom. Upon his return to France, he created the franc to stabilize the currency and tried to get rid of the free companies by sending them to a crusade, but Pope Innocent VI died shortly before their meeting in Avignon. When John was informed that Louis had escaped from captivity, he voluntarily returned to England, where he died in 1364. He was succeeded by his son Charles V.
John was nine years old when his father had himself crowned as Philip VI of France. Philip VI's ascent to the throne was unexpected: because of the Salic law, all female descendants of his great uncle Philip the Fair were passed over; it was also disputed because it bypassed the claim of a more direct relative of Philip the Fair, his grandson, Edward III of England. Thus, as new King of France, Philip had to consolidate his power in order to protect his throne from rival claimants; therefore, he decided to marry off his son John quickly at the age of thirteen to form a strong matrimonial alliance, at the same time conferring upon him the title of Duke of Normandy. Initially a marriage with Eleanor of Woodstock, sister of King Edward III of England, was considered, but instead Philip invited John of Luxembourg, King of Bohemia, to Fontainebleau. Bohemia had aspirations to control Lombardy and needed French diplomatic support. A treaty was drawn up. The military clauses stipulated that, in the event of war, Bohemia would support the French army with four hundred infantrymen. The political clauses ensured that the Lombard crown would not be disputed if the king of Bohemia managed to obtain it. Philip selected Bonne of Bohemia as a wife for his son, as she was closer to child-bearing age (16 years), and the dowry was fixed at 120,000 florins. John reached the age of majority, 13 years and one day, on 27 April 1332, and received overlordship of the duchy of Normandy, as well as the counties of Anjou and Maine. The wedding was celebrated on 28 July at the church of Notre-Dame in Melun in the presence of six thousand guests. The festivities were prolonged by a further two months when the young groom was finally knighted at the cathedral of Notre-Dame in Paris. As the new Duke of Normandy, John was solemnly granted the arms of a knight in front of a prestigious assembly bringing together the kings of Bohemia and Navarre, and the dukes of Burgundy, Lorraine and the Brabant. Upon his accession as Duke of Normandy in 1332, John had to deal with the reality that most of the Norman nobility was already allied with the English camp. Effectively, Normandy depended economically more on maritime trade across the English Channel than on river trade on the Seine. The duchy had not been English for 150 years, but many landowners had holdings across the Channel. Consequently, to line up behind one or other sovereign risked confiscation. Therefore, Norman members of the nobility were governed as interdependent clans, which allowed them to obtain and maintain charters guaranteeing the duchy a measure of autonomy. It was split into two key camps, the counts of Tancarville and the counts of Harcourt, which had been in conflict for generations. Tension arose again in 1341. King Philip, worried about the richest area of the kingdom breaking into bloodshed, ordered the bailiffs of Bayeux and Cotentin to quell the dispute. Geoffroy d'Harcourt raised troops against the king, rallying a number of nobles protective of their autonomy and against royal interference. The rebels demanded that Geoffroy be made duke, thus guaranteeing the autonomy granted by the charter. 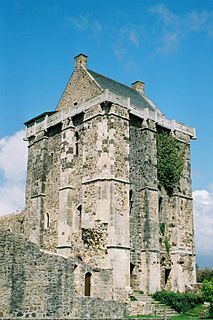 Royal troops took the castle at Saint-Sauveur-le-Vicomte and Geoffroy was exiled to Brabant. Three of his companions were decapitated in Paris on 3 April 1344. In 1342, John was in Avignon at the coronation of Pope Clement VI, and in the latter part of 1343, he was a member of a peace parley with Edward III of England's chancery clerk. By 1345, increasing numbers of Norman rebels had begun to pay homage to Edward III, constituting a major threat to the legitimacy of the Valois kings. The defeat at the Battle of Crécy on 26 August 1346, and the capitulation of Calais on 3 August 1347, after an eleven-month siege, further damaged royal prestige. Defections by the nobility, whose land fell within the broad economic influence of England, particularly in the north and west, increased. Consequently, King Philip VI decided to seek a truce. Duke John met Geoffroy d'Harcourt, to whom the king agreed to return all confiscated goods, even appointing him sovereign captain in Normandy. John then approached the Tancarville family, whose loyalty could ultimately ensure his authority in Normandy. The marriage of John, Viscount of Melun, to Jeanne, the only heiress of the county of Tancarville, ensured that the Melun-Tancarville party remained loyal to John, while Geoffroy d'Harcourt continued to act as defender for Norman freedoms and thus of the reforming party. On 11 September 1349, John's wife, Bonne of Bohemia (Bonne de Luxembourg), died at the Maubuisson Abbey near Paris, of the Black Death, which was devastating Europe. To escape the pandemic, John, who was living in the Parisian royal residence, the Palais de la Cité, left Paris. On 9 February 1350 (1349 in former Julian calendar when year was beginning in March), five months after the death of his first wife, John married Joan I, Countess of Auvergne, in the royal Château de Sainte-Gemme (that no longer exists), at Feucherolles, near Saint-Germain-en-Laye. Philip VI, John's father, died on 22 August 1350, and John's coronation as John II, king of France, took place in Reims the following 26 September. Joanna, his second wife, was crowned queen of France at the same time. In November 1350, King John had Raoul II of Brienne, Count of Eu seized and summarily executed, for reasons that remain unclear, although it was rumored that he had pledged the English the County of Guînes for his release. In 1354, John's son-in-law and cousin, Charles II of Navarre, who, in addition to his Kingdom of Navarre in the Pyrenees mountains, border between France and Spain, also held extensive lands in Normandy, was implicated in the assassination of the Constable of France, Charles de la Cerda. Nevertheless, in order to have a strategic ally against the English in Gascony, John signed the Treaty of Mantes with Charles on 22 February 1354. The peace did not last between the two, and Charles eventually struck up an alliance with Henry of Grosmont, the first Duke of Lancaster. The following year, on 10 September 1355, John and Charles signed the Treaty of Valognes, but this second peace lasted hardly any longer than the first. In 1355, the Hundred Years' War flared up again. In July 1356, Edward, the Black Prince, son of Edward III of England, took an army on a great chevauchée through France. John pursued him with an army of his own. In September the two forces met a few miles southeast of Poitiers. John was confident of victory—his army was probably twice the size of his opponent's—but he did not immediately attack. While he waited, the papal legate went back and forth, trying to negotiate a truce between the leaders. There is some debate over whether the Black Prince wanted to fight at all. He offered his wagon train, which was heavily loaded with loot. He also promised not to fight against France for seven years. Some sources claim that he even offered to return Calais to the French crown. John countered by demanding that 100 of the Prince's best knights surrender themselves to him as hostages, along with the Prince himself. No agreement could be reached. Negotiations broke down, and both sides prepared for combat. On the day of the Battle of Poitiers, John and 17 knights from his personal guard dressed identically. This was done to confuse the enemy, who would do everything possible to capture the sovereign on the field. In spite of this precaution, John was captured. Though he fought with valor, wielding a large battle-axe, his helmet was knocked off. Surrounded, he fought on until Denis de Morbecque, a French exile who fought for England, approached him. "Sire," Morbecque said. "I am a knight of Artois. Yield yourself to me and I will lead you to the Prince of Wales." King John surrendered by handing him his glove. That night King John dined in the red silk tent of his enemy. The Black Prince attended to him personally. He was then taken to Bordeaux, and from there to England. While negotiating a peace accord, John was at first held in the Savoy Palace, then at a variety of locations, including Windsor, Hertford, Somerton Castle in Lincolnshire, Berkhamsted Castle in Hertfordshire, and briefly at King John's Lodge, formerly known as Shortridges, in East Sussex. Eventually, John was taken to the Tower of London. The first franc ever minted, the "Franc à cheval", was minted upon Jean le Bon's return from captivity from 5 December 1360, and featured combative imagery. Gold, 24 karat, 3.73g. It conveniently coincided with the account value of one livre tournois. As a prisoner of the English, John was granted royal privileges that permitted him to travel about and enjoy a regal lifestyle. At a time when law and order was breaking down in France and the government was having a hard time raising money for the defence of the realm, his account books during his captivity show that he was purchasing horses, pets, and clothes while maintaining an astrologer and a court band. The Treaty of Brétigny (1360) set his ransom at 3 million crowns. Leaving his son Louis of Anjou in English-held Calais as a replacement hostage, John was allowed to return to France to raise the funds. On 1 July 1363, King John was informed that Louis had escaped. Troubled by the dishonour of this action, and the arrears in his ransom, John did something that shocked and dismayed his people: he announced that he would voluntarily return to captivity in England. His council tried to dissuade him, but he persisted, citing reasons of "good faith and honour." He sailed for England that winter and left the impoverished citizens of France again without a king. John was greeted in London in 1364 with parades and feasts. A few months after his arrival, however, he fell ill with an unknown malady. He died at the Savoy Palace in April 1364. His body was returned to France, where he was interred in the royal chambers at Saint Denis Basilica. John suffered from fragile health. He engaged little in physical activity, practised jousting rarely, and only occasionally hunted. Contemporaries report that he was quick to get angry and resort to violence, leading to frequent political and diplomatic confrontations. He enjoyed literature and was patron to painters and musicians. The image of a "warrior king" probably emerged from the courage in battle he showed at the Battle of Poitiers and the creation of the Order of the Star. 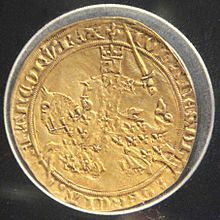 This was guided by political need, as John was determined to prove the legitimacy of his crown, particularly as his reign, like that of his father, was marked by continuing disputes over the Valois claim from both Charles II of Navarre and Edward III of England. From a young age, John was called to resist the decentralising forces affecting the cities and the nobility, each attracted either by English economic influence or the reforming party. He grew up among intrigue and treason, and in consequence he governed in secrecy only with a close circle of trusted advisers. He took as his wife Bonne of Bohemia and fathered 11 children in eleven years. Due to his close relationship with Charles de la Cerda, rumours were spread by Charles II of Navarre of a romantic attachment between the two. La Cerda was given various honours and appointed to the high position of connetable when John became king; he accompanied the king on all his official journeys to the provinces. La Cerda's rise at court excited the jealousy of the French barons, several of whom stabbed him to death in 1354. La Cerda's fate paralleled that of Edward II of England's Piers Gaveston and John II of Castile's Alvaro de Luna; the position of a royal favourite was a dangerous one. John's grief on La Cerda's death was overt and public. John II was succeeded by his son, Charles, who reigned as Charles V of France, known as The Wise. ^ François Autrand (1994). Charles V le Sage. Paris: Fayard. p. 13. ^ Papal Coronations in Avignon, Bernard Schimmelpfennig, Coronations: Medieval and Early Modern Monarchic Ritual, ed. János M. Bak, (University of California Press, 1990), pp. 191-192. ^ Sumption, Jonathan, Trial by Battle: The Hundred Years War I, Faber & Faber, 1990, p. 436. ^ Anselme de Sainte-Marie, Père (1726). Histoire généalogique et chronologique de la maison royale de France [Genealogical and chronological history of the royal house of France] (in French). 1 (3rd ed.). Paris: La compagnie des libraires. p. 105. ^ Jones, Michael. "The last Capetians and early Valois Kings, 1314-1364", Michael Jones, The New Cambridge Medieval History: Volume 6, c.1300-c.1415, (Cambridge University Press, 2000), 391. ^ a b c d Anselme 1726, pp. 100–101. ^ a b Anselme 1726, p. 103. ^ a b Anselme 1726, pp. 87–88. ^ a b Anselme 1726, pp. 83–87. ^ Joni M. Hand, Women, Manuscripts and Identity in Northern Europe, 1350-1550, (Ashgate Publishing, 2013), 12. ^ a b c d e Marguerite Keane, Material Culture and Queenship in 14th-century France: The Testament of Blanche of Navarre (1331-1398), (Brill, 2016), 17. The House of Valois was a cadet branch of the Capetian dynasty. They succeeded the House of Capet to the French throne, and were the royal house of France from 1328 to 1589. Junior members of the family founded cadet branches in Orléans, Anjou, Burgundy, and Alençon. Charles IX was King of France from 1560 until his death in 1574 from tuberculosis. He ascended the throne of France upon the death of his brother Francis II in 1560. Charles was the twelfth king from the House of Valois, the fifth from the Valois-Orléans branch, and the fourth from the Valois-Orléans-Angoulême branch. Charles II, called Charles the Bad, was King of Navarre 1349–1387 and Count of Évreux 1343–1387. Charles V, called "the Wise", was King of France from 1364 to his death, the third from the House of Valois. His reign marked a high point for France during the Hundred Years' War, with his armies recovering much of the territory held by the English, and successfully reversed the military losses of his predecessors. Francis, Duke of Anjou and Alençon was the youngest son of Henry II of France and Catherine de' Medici. In the Middle Ages, the Duke of Normandy was the ruler of the Duchy of Normandy in north-western France. The duchy arose out of a grant of land to the Viking leader Rollo by the French king Charles III in 911. In 924 and again in 933, Normandy was expanded by royal grant. Rollo's male-line descendants continued to rule it down to 1135. In 1202 the French king Philip II declared Normandy a forfeited fief and by 1204 his army had conquered it. It remained a French royal province thereafter, still called the Duchy of Normandy, but only occasionally granted to a duke of the royal house as an apanage. Francis II of Brittany was Duke of Brittany from 1458 to his death. He was the grandson of John IV, Duke of Brittany. A recurring theme in Francis' life would be his quest to maintain the quasi-independence of Brittany from France. As such, his reign was characterized by conflicts with King Louis XI of France and with his daughter, Anne of France, who served as regent during the minority of her brother, King Charles VIII. The armed and unarmed conflicts between 1484–1488 have been called the Mad War and also the "War of the Public Weal". Peter I of Bourbon was the second Duke of Bourbon, from 1342 to his death. Bonne of Luxemburg or Jutta of Luxemburg, was born Jutta (Judith), the second daughter of John the Blind, king of Bohemia, and his first wife, Elisabeth of Bohemia. She was the first wife of King John II of France; however, as she died a year prior to his accession, she was never a French queen. Jutta was referred to in French historiography as Bonne de Luxembourg. She was a member of the House of Luxembourg. Among her children were Charles V of France, Philip II, Duke of Burgundy, and Joan, Queen of Navarre. 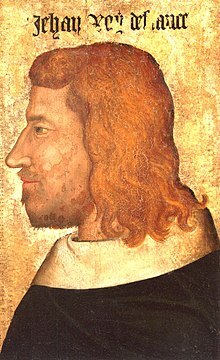 Louis of Évreux was a prince, the third son of King Philip III of France and his second wife Maria of Brabant, and thus a half-brother of King Philip IV of France. James I of Bourbon was the son of Louis I, Duke of Bourbon and Mary of Avesnes. He was Count of Ponthieu from 1351 to 1360, and Count of La Marche from 1341 to his death. Charles de La Cerda, commonly known as Charles of Spain, was a Franco-Castilian nobleman and soldier, the son of Alfonso de la Cerda of Spain and Isabelle d'Antoing, and grandson of Alfonso de la Cerda the disinherited (1270–1333). He was a distant cousin of John II of France. Philip of Orléans was a Duke of Orléans, Touraine, and Count of Valois, the fifth son of King Philip VI of France and his wife Joan the Lame. Joan of France, also known as Joan or Joanna of Valois, was the daughter of John II of France, and his first wife, Bonne of Luxembourg. She married Charles II of Navarre, and became Queen-consort of Navarre. Marie of Berry was suo jure Sovereign Duchess of Auvergne and Countess of Montpensier in 1416-1434. She was the daughter of John, Duke of Berry, and Joanna of Armagnac. She was married three times. She acted as administrator of the Duchy of Bourbon for her third spouse John I, Duke of Bourbon, during his imprisonment in England after he was captured following the French defeat at the Battle of Agincourt in 1415, until 1434. The House of Harcourt is a Norman family, descended from the Viking Bernard the Dane, the brother of Rollo of Normandy, and named after its seigneurie of Harcourt in Normandy. Its mottos were "Gesta verbis praeveniant", "Gesta verbis praevenient", and "Le bon temps viendra ... de France". Robert I of Bar was Marquis of Pont-à-Mousson and Count and then Duke of Bar. He succeeded his elder brother Edward II of Bar as count in 1352. His parents were Henry IV of Bar and Yolande of Flanders. Geoffroy de Harcourt, "the lame" Viscount of Saint-Sauveur, was a 14th century French noble.